Acaricide: pesticide, natural or synthetic, selectively acting on mites. Allele: gene variant that carries one or several mutation(s). Antagonism: combined effect of two or more pesticides that is lower than the sum of their separate effects. Cross-resistance: resistance to several pesticides mediated by the same allele (or by extension by the same mechanism). Cross-resistance can be positive (resistance to several pesticides) or in some cases negative (resistance to some pesticides entailing hypersensitivity to others). Discriminating dose (rate): under controlled conditions, the pesticide dose killing or inhibiting the growth/development of all genotypes considered as sensitive. Any genotype able to grow, develop or survive at this dose correctly applied is considered resistant. EC50 = 50% effective concentration: pesticide concentration inhibiting 50% of a biological activity measured under controlled conditions; syn. ED50 (50% effective dose), IC50 (50% inhibitory concentration), LD50 (50% lethal dose). Fitness: ability of one genotype to survive in competition with others and to produce a viable offspring. Fitness penalty: see “Resistance cost”. Formulation: set of compounds used to facilitate handling, application, penetration and selectivity of pesticides. Fungicide: pesticide, natural or synthetic, selectively acting on fungi. Genome: all the genes of one individual. Genotype: individual or individuals possessing the same genome. Herbicide (syn, weed-killer): pesticide, natural or synthetic, selectively acting on weeds. I50: in enzymology, pesticide concentration inhibiting 50% of the target enzyme activity. Insecticide: pesticide, natural or synthetic, selectively acting on insects. MDR or Multi-Drug Resistance: class of non-target-site resistance mediated by exacerbated pesticide efflux and causing resistance to several pesticides with different modes of action. MDR is often caused by the overexpression of one or several membrane drug transporter(s). Mode of action (MoA): refers to the biochemical target of one pesticide. 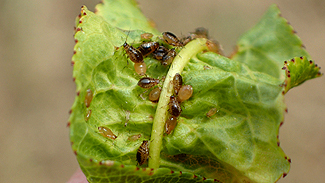 Pesticides can be classified according to their target. Multiple resistance: resistance to several pesticides mediated by different alleles (or by extension by different mechanisms). Multi-site: pesticide (mostly fungicides) acting on several targets. Mutation: change in the DNA sequence of the genome. One or several mutation(s) modifying the expression level of one gene or the structure of protein it encodes can be at the root of resistance. Non-target site resistance (NTSR): resistance caused by mechanisms other than target-site resistance (e.g., pesticide efflux or MDR, enhanced metabolism, sequestration or reduced penetration). Pest: a living organism detrimental to crop production that can be an animal (arthropods, rodents…), a plant (weeds), or a micro-organism (bacteria, fungi, virus…). Pesticide: a compound (synthetic or natural) that kills pests or inhibits their growth or development. Syn, plant protection product. The three classes of pesticides are fungicides, herbicides, acaricides and insecticides. Population: all the genotypes of one pest species exchanging genes. For the sake of convenience, population can also refer to all the genotypes of one pest species present in one field. 1. intrinsic, inheritable ability of some pest genotypes to survive pesticide concentrations that kill or inhibit the development of sensitive genotypes of the same species (sensitive genotypes). This capacity is due to naturally occurring mutation(s) in the genome of resistant genotypes. 2. Outcome of the adaptive evolution of pest populations under pesticide selective pressure that is due to the selection and the subsequent increase in frequency of the least sensitive genotypes. Resistance cost = fitness penalty: loss of fitness of a genotype directly caused by the acquisition of resistance. Can be caused by the modification of various life traits (e.g. number of viable offspring produced, growth rate …). Caution: resistance does not always entail a fitness penalty. Some resistances even cause a fitness benefit, in which case resistant genotypes produce more viable offspring, grow faster… than the sensitive ones. Resistance frequency: proportion of resistant genotypes in a population of pests. Caution: the resistance frequency is often confused with the resistance level, which is wrong. Resistance in practice = Field resistance: decrease in the efficacy in the field of a pesticide relative to the efficacy of the same pesticide measured before on a reference population. Field resistance is confirmed when (i) other factors that may have led to a decrease in efficacy (e.g. substandard application, wrong spray timing, lack of intrinsic activity of the pesticide considered on the pest targeted, etc.) have been refuted and (ii) when a significant increase in the frequency of resistant pest genotypes has been demonstrated in the population. Resistance level (RL), resistance factor (RF) or resistance ratio (RR): ratio of the respective pesticide concentrations required to obtain the same effect on resistant genotypes and on reference sensitive genotypes of a same pest species. The RL is usually expressed as the ratio (EC50 resistant / EC50 sensitive), determined by exposing these genotypes to a range of concentrations (under identical, controlled conditions). Resistance mechanism: any mechanism allowing a genotype to survive a pesticide concentration that kills or inhibits the growth or development of sensitive genotypes. Selective pressure: environmental constraint modulating the fitness of genotypes. When applied, a selective pressure favours genotypes displaying the best fitness. Thus, a selective pressure exerted by pesticides favours the less sensitive (or most resistant) genotypes. Sensitive reference or reference population: a population containing only pesticide-sensitive genotypes. Ideally, should be representative of all the populations of the pest considered prior to any use of the pesticide(s) of interest. Specific enzyme activity: amount of product generated by an enzyme per unit of time and per unit amount of protein. Synergism: combined effect of two or more pesticides greater than the sum of their separate effects. Target (pesticide target): protein (enzyme, structural protein…) vital for the physiology of one pest. A pesticide exerts its action by disrupting the function of its target enough to kill or inhibit the development of the pest. Target-site resistance (TSR): resistance caused by mutations affecting the pesticide target protein gene (target protein modification, gene amplification or increased expression). Single-site: pesticide with one single biochemical target (most pesticides).